The paper proposes three basic principles for the synthesis of mobile robots: the accumulation and conversion of energy, the integration of motion drives and the use of a generator of reactive pneumatic traction. These technical solutions allow robots to navigate on surfaces of arbitrary orientation in different coordinate systems. The implementation of these principles contributes to reducing the total power of the drives and increasing the reliability of holding robots on the surface of arbitrary orientation in the technological space. The results of mathematical modelling of constructive and technological parameters of mobile robots are described. Friction clutches are mechanisms placed between the engine and the gearbox and are used to transmit the torque from the engine of the vehicle to the transmission. The clutches should provide start and stopping of the vehicle without vibration and need to have a certain lifetime. The tribological parameters of the linings in these clutches depend on several factors: the quality of the linings, the conditions of the test (exploitation), the temperature between the friction surfaces, the specific pressure between the friction surfaces, the speed of sliding of the friction linings, the number of turns on the clutch, etc. In this paper, will be analyzed the impact of the speed of sliding of friction linings on the tribological parameters of the linings. 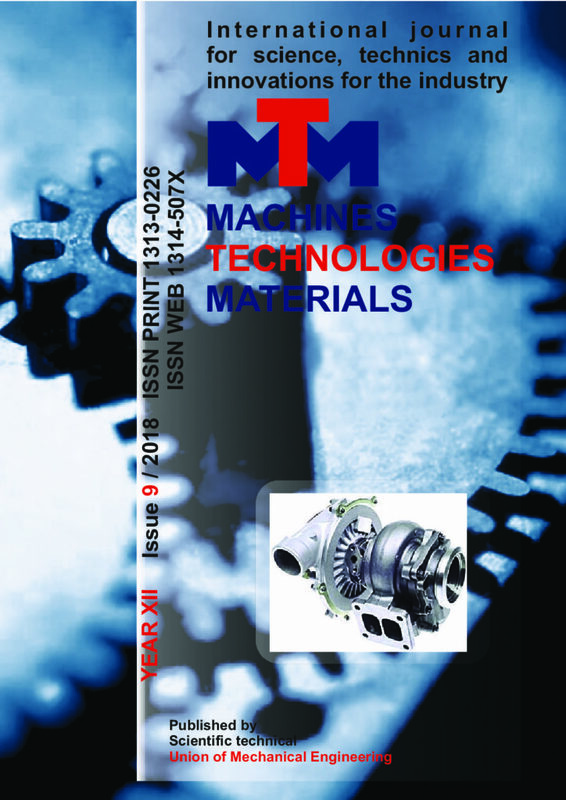 In this paper is presented development and implementation of embedded microprocessory SCADA system in factory for production of Ferro-Nickel. In the process of refining of the molten metal are released huge amount of hot gasses that should be purified before letting them to the atmosphere. The project is to change old system of rellay logic and separately located indicators and controllers with centralised SCADA system with PLC and HMI interface, to monitor and control the work of gas Scrubbers and venting system. The paper presents SCADA system functionality and the advantages from the new digital over the old analog equipment. Architecture patterns help define the basic characteristics and behavior of an application. Some architecture patterns lend themselves toward highly scalable applications, whereas other architecture patterns naturally lend themselves toward applications that are highly agile. Knowing the characteristics, strengths, and weaknesses of each architecture pattern is necessary in order to choose the one that meets your specific business needs and goals.As a software architect, you must always justify your architecture decisions, particularly when it comes to choosing a particular architecture pattern or approach. The goal of this report is to give you enough information to make and justify that decision. A mathematical formulation of the boundary problems of mathematical physics is made, sequential solution which allows describing the stress-strain state and the transfer characteristics of the piezoelectric elements with surfaces partial covering by electrodes. The set of formulated boundary problems makes mathematical content of energy-power method of analysis of the physical condition of the piezoelectric elements in the regime of forced oscillations under the influence of an external source of electrical energy. The proposed sequence of computational procedures can be used in the study of forced oscillations of microelectromechanical structures. The concept of a society of knowledge is considered in the article. It is proved that the knowledge economy, the core of which is the creative economy, provides the formation of a knowledge society. Today, the cultural industry, or creative economy, is considered as a new type of industry. The essence and peculiarities of the creative potential of a specialist are determined. The forecast indicators of Ukraine’s creative potential development are presented. It is revealed that modern problems of economic development are connected with the intellectualization of labor, giving the highest priority to the processes of producing new knowledge. To achieve predictive indicators of intellectual and creative activity in Ukraine, it is necessary to fulfill certain tasks. Lanthanum strontium manganites, doped with zinc have been studied by magnetic resonance. In the paramagnetic phase, regions with a ferromagnetic order with superparamagnetism properties are observed. Using the theory of Raikher and Stepanov for superparamagnetic particles, the analysis of the temperature dependence of the magnetic resonance linewidth and resonance field was performed. This analysis allowed to estimate the size of ferromagnetically correlated regions and the magnitude of the magnetic anisotropy. A method is proposed for determining the temperature dependences of thermal effects (the amount of heat released when the temperature changes) based on data on the temperature-concentration dependences of the free energies of the phases of metallic systems. These dependences are necessary for modeling of the processes of crystallization of alloys. They make it possible to obtain temperature dependences of the dimensions of the thermal effects without introducing the results of measurements of direct calorimetry. The peculiarity of calculating of the temperature dependences of thermal effects upon cooling of binary metal systems from the liquid state to room temperature (including crystallization) is shown using the example of the alloy of the system Pb-Sn. In the present work, the adhesion and physico-mechanical characteristics of heat-resistant vacuum coatings formed on steel substrates are investigated. An increase in the values of adhesion and physico-mechanical parameters of coatings formed from multicomponent compounds is established. The tribotechnical characteristics of coatings based on chromium carbonitride have been studied.